Building links is one of the most efficient way to boost your search ranking. Link building may be archaic for some because of the available software that can do this job for you but SEO specialists and marketers alike still see this as an efficient tool in establishing your product or services’ digital presence. In the industry of SEO services, jobs pertaining to link building can be written off as creating spam content. While this may be true for those who stick to unethical practices, the link builders who craft quality links shy away from thisdescription. Link building is one of the most rewarding SEO services since they are a vital contribution to a website’s SEO ranking. The internet can be compared to a noisy marketplace where you are fed many offers with every scroll you make on a page, which can be overwhelming at times. A link that stands out is the one that contains quality content and efficient link builders use this to their advantage. White hat SEO practices make for quality link building. Generating links requires a tactic, and like any strategy, you cannot just go into it blindly what with the penalties that Google may sanction you with. Black hat link building is not advisable if you have long-term goals for your website. Proceed with caution and an expectation of the consequences if you opt for this method since Google can see through these ways which will result in wasted efforts and invested money will all go down the drain. While spending money sounds like an instant answer for link building, buying links is an inefficient strategy as well as a means to get penalized. There are SEO link builders who will say that there is nothing wrong with spending money for links but truthfully, this will benefit the one who sold you the link more than it will for your site. Google’s advertising and webmaster guidelines provide a way around the algorithm which makes paid links appealing to some, but it is still highly recommended that you avoid this strategy altogether. Bottom line is, buying links is a bad idea because if you get caught, you will be losing more than what you have gained in your paid link. Not only is your link in danger of being cancelled but your site as well. Google’s Penguin update works in real-time which means that if you get caught using unethical practices, you will see it affect your rankings immediately. Instead of buying links, why not invest your funds on content strategy tools and efficient marketing techniques, which will be an organic way to build links to your site. Since links make up almost 75% of your website’s search engine optimization facet, it helps to have a keen eye on quality links and disavow low quality ones. These links would be sloppy and unprofessional for website visitors. You wouldn’t want to make a bad first expression, would you? To identify low quality links, you have to look at the link’s Domain Authority (DA) and Page Authority (PA). A low score on these criteria means that the sources will not amount to much in improving your site’s ranking. Find out if the website is still starting up because if you use this as a source then you probably arrive at a dead end too since there is no content to work with. Sites with low-quality content are a no-go either. Another important identifier of a low quality link is if it isn’t Search Engine Optimization (SEO) friendly. The web development of the site will pretty much speak for itself. As a link builder, you will know at first glance if it is not up for SEO. Avoid acquiring backlinks from these sources by using useful tools like the Google Link Count, which you can use to check if a certain website is worth pursuing. Or you can use Moz’s Open Site Explorer which determines the quality score of a website. It ranks a website from 0 to 100 based on their link profile. If your link has an authority score that is above 25, then it is a good enough rank, but aim to get into the 50+ range for a solidified quality of your backlinks. Content which contains lots of data may be tempting to publish because you might think that all of the collected data might be wasted if you don’t. But compressing too much data will just result in the reader to lose interest easily. A big chunk of info is not easy to digest so it will be even harder to entice visitors to take a bite out of it. Only include the most insightful, interesting data points in your content, even if that means tossing aside most of the data you’ve gathered. Consider this: It shouldn’t take a publisher more than 10 seconds of looking at your project to grasp the most meaningful data points. If they can’t quickly understand that, how will their readers? Consider publishing infographics instead or a concise text which does not take up too much of the white space of your page. Also, avoid spun content because this will make your content look like it’s spam. Spun content is when you use synonyms to replace published words to make Google think that it is a new and unique content. The repetitive appearance of a spun article is identical to black hat link building practices. It doesn’t help that there is software to spin content which makes it easy for spam to build up. Choose content wisely and categorize them according to quality. If you are going to reuse a data that has been published prior to the new idea you are going to present, make sure that it is remodeled based on new trend or it is equipped with a new spin already. Repackaging content in a new format can work well once but if you do it in a repetitive manner, then your ranking is bound to fail. Say something new about the data and if you really need to recycle a published data, make sure that it is relevant. Find out if many people have already seen it so that you will know if it can stay relevant the way it is or you have to make a few changes to it. While this may be acceptable, do not overdo it. You can opt to use small parts of the content and repurpose it for social media, lay it on an infographic, or anything else that will provide something new in order to give you a significant SEO boost. Link building is a flexible job in SEO services. The strategies in building links can keep changing but you have to stick by ethical and clean practices to give your digital audience a great digital marketing experience. 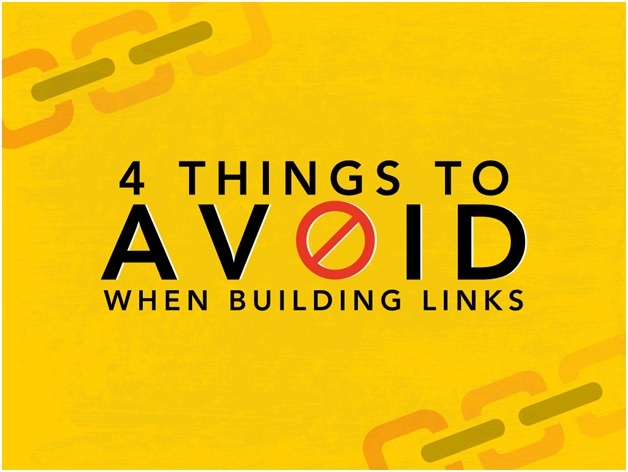 These 4 things to avoid when link building will help you in being mindful of the practices in link building. Keep them in mind the next time you are building links for SEO. Good luck! Adrian is a freelance writer, marketing specialist, and SEO freelancer. Adrian writes for multiple blogs and about any niches. He just started his own blog but is still in progress. Cool name of the blog and good content. Keep it up you will succeed IA. Thank you so much for your nice complement.